Beaver Valley still leads the best-of-seven Murdoch Final 3-2 with Game six Saturday in Fruitvale. Scoreless through 30-plus minutes thanks in part to netminding by Mint and Noah Decottignies of the Hawks, the Leafs broke through on Beaver Valley when Tyler Nypower snapped a shot that just narrowly cross the goalline. The goal snapped a scoreless streak of more than 90-plus minutes by Nelson. The Nitehawks tried to rally before the period concluded, but Mint was equal to the task. In the third, Nelson struck for two goals in a 90-second span by Cole Wyatt and Shawn Grobowsky to open up the three-goal advantage before completely suffocating the Hawks’ shooters and supporting Mint on his way to the shutout in goal. Mint, named Nelson's Game Start, finished the game stopping all 23 shots the Nitehawks fired at the Leafs cage. The fact Mint played the game came as a result of both of Nelson's regular goalies, Caiden Kreitz and Hunter Young, are out of the lineup due to injury. The loss of Kreitz and Young forced the Nelson coaching staff to start Mint and call on Charles Curiston to dress as the backup. PLAYOFF NOTES: Kootenay Ice affiliate goalie Tenzin Mint played three games for Nelson this season, finishing with a 1-2 record. 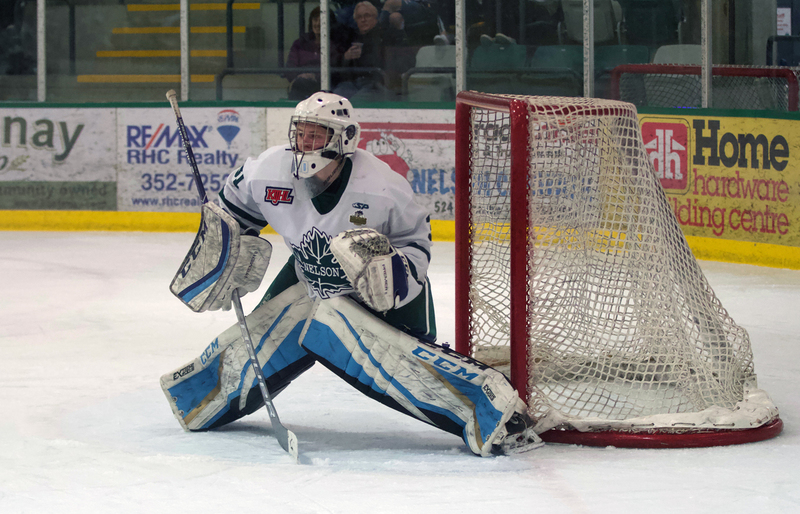 The lone win, a shutout, came December 1 against Castlegar. . . . Along with Mint and Charles Curiston, the Leafs also called up Noah Quinn from the Kootenay Ice Major Midget affiliate. . . .The game attracted more than 1000 fans with spectators lining up outside the NDCC Arena waiting to purchase tickets for the game. . . . If a Game seven is needed to decide the series, it will be played Sunday at the NDCC Arena with a 6 p.m. start time. . . .The Murdoch winner travels to Kimberley Tuesday to meet the Nitros in Game one of the Kootenay Conference Final. Kelowna Chiefs and Revelstoke Grizzlies meet in the Okanagan/Shuswap Conference Final.